Which is Best 3G Dongle in India Dongle is a small hardware device that plugs into the USB port of a computer and get access to Internet. Its purpose is to ensure that only authorized users can use certain software applications. The Main Purpose of Dongle is it’s Portability can be used anywhere you want to access Internet but some times there is a problem with Signal Power, If Signal Power is very Low then your Internet Speed would be low. Hence Before Buying any Dongle Call their appropriate Company Customer Support and ask for Demo Installation at your House, If you get good Signal Strength then go for it. Airtel is one of the Most popular for it’s Internet Service and it’s cheap Plans which satisfy the Customer, Now they have provided Double Data Plan Offer which will give you double data for what you pay means if you pay rs 100 then you will get 200MB data. 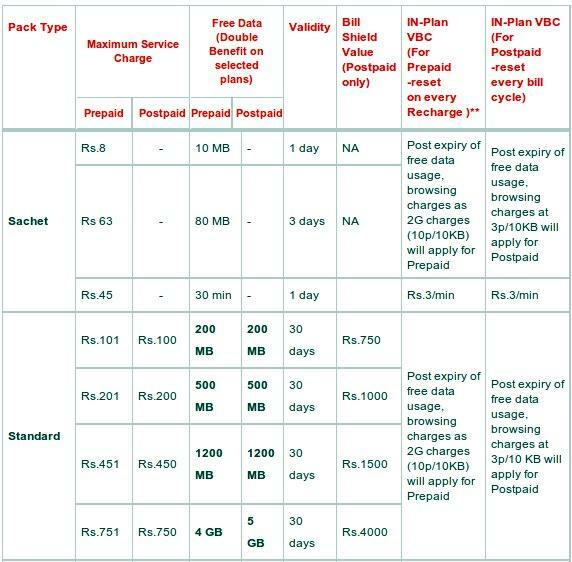 All the Standard 3G packs now offer double data on recharge for both the Prepaid and Postpaid users. Choose variety of 3G plans and get set to enjoy a world of possibilities with airtel internet on 3G, Select your airtel 3G plans in your city. MTS Mblaze is a leading low price high speed mobile broadband Internet service offered by MTS India.The price of MTS Mblaze is Rs.899/- and Downloading Speed Up to 3.1 Mbps and has Slot for Micro SD Memory card so that it can be used as Card reader or Pendrive. Note:- Before Buying Reliance 3G Dongle Call 9810831222, 9212121272, 9211678311 for free demo and best offers. Idea Cellular is the 3rd largest telecom operator and one of the top 3G service provider in India. Idea has Introduce 5 New Types of 3G data plans they are Sachet Based, Usage Based, Time Based, Data Rate Cutter, Dongle Tariffs. Note:- Sachet Based and Time Based data plans are only applicable in prepaid connections and other plans can be activated in both prepaid and postpaid connections. 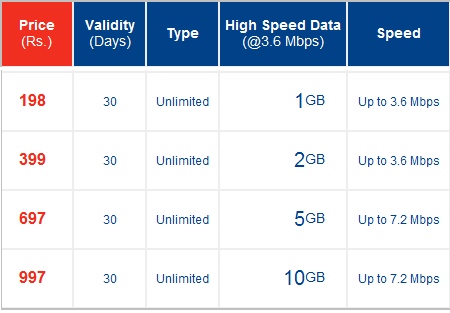 Aircel launched many new Unlimited 3G plans with low price.Aircel 3G plans are just starting from 8 rupees and provide you unlimited speed. Aircel is largest telecom company of India and providing his services in most of states in India. Aircel 3G Dongle is also Known as Turbo 3G and Price at Rs. 3500/- that offers wireless broadband download speeds up to 7.2Mbps and uploads up to 5.76Mbps. It also Support Micro SD Memory card up to 32 GB. Note:- Please check plans from their official site because they give different plans for different state. I have heard a lot about MTS MBlaze, it seems to be the greatest one among these dongles. Gotta give it a shot now. ya MTS MBlaze is one of the best dongle….Many of my frnds are using it…..
During train journey in Punjab/Delhi area and in Bangalore which internet connectivity is powerful so that I can use dongle in my Laptop? Go for Airtel or Reliance Dongle……I have tried reliance dongle in Banglore it’s working good….. Does MTS 3g dongle has truly(no post data charges)unlimited plans in chennai?? ya…..MTS Provide Unlimited plans all over India…. Thanks i was browsing on Google to finally landed on a blog where i can get all the dongle info together. Thanks this was right place ,saved lot of my time. I m thinking to take MTS ..
i need unlimited downloadin…any info on that..
Is MTS giving a good speed? ya….MTS gives good speed for browsing and also it’s cheap..
hey… is mts EC122 a 2g or a 3g dongle??? If you have to buy a 3g dongle regardless of the plans which dongle will u choose????? I would prefer to go with Reliance 3G Dongle……. I can put a Reliance SIM in a MTS dongle right? then y dont people simply buy a cheap dongle and buy a SIM of their choice……. NO u can’t Insert reliance SIM in MTS…If u can then you have to do Unlocking which is not official.. I am student and need to do online classes for 2 months. Data usage is high but I want to know which is the best plan for me. Speed matters but I would like a unlimited plan for me. If I have to buy a 3G dongle which one should I buy? I want the dongle to be usable for any service provider which I can select based on their available plans. There are many suppliers like Micromax, digisol etc but I need guidance from the tech wizard like you. mts has terrible service, net wise and customer wise. You end up spending too much on something that is not worth the time or money. please go for something else like reliance. How is the Huwaei dongle? Can I insert any simcard of my choice in it? hey i want a dongle for gaming purpose so which is best for me?? n may u plz tell me the drawback of MTS n Relience?? If I want to download movies, songs, or large groups of data then which dongles is in the best choice(more preferred) or should i take a wired connection.Do we need to pay bill every month(prepaid)or we can skip months?as in case of dongle. If i wish to download lots of movies,songs and data so which dongle should i choose(prepaid) i.e,unlimited?And can i use dongle for alternative months(may skip few months)? first check for range and then decide which one to select from above information….reliance, idea, MTS are good…. go for MTS or reliance…. Does reliance 3G dongle works in Pune? Just make a call to reliance helpline they will give you demo of dongle and then check if it working or not…..I think it should work @ Pune..
Hi, I want to buy a Dongle for use in Pune. I am only concerned about the speed. I have found a couple of 3g dongles online with speed of 21.6 mbps. Is there any other dongle available with a higher speed? If yes then can you please let me know the service provider and if answer is No then which is the best 3g dongle available in terms of speed. I think reliance is good in terms of Speed…. I think this is the first of its kind page offering some kind of sane advice on the broadband dongles to be used by laptops in India. But it seems we can buy these dongles from the Huawei sites and put the sim cards there.. Can you please give me more info on these Huawei dongles and whether it is better to go in for these ‘neutral’ dongles so that we can change the sim and switch over to a new provider. Hope my question is clear ! Thanks. hi, I want to use my Airtel sim, Can I use Reliance or ideia dongal ? I am placed at Bilaspur in Chattisgarh state.i want to buy a dongle for high speed broadband service.Can u opine which service provider is offering efficient service in this part of the country and particular dongle model to be bought. Go for reliance Rs.650 plan which will give you 3GB data for downloading and surfing Internet with good Speed….. Which dongle is better Airtel 3g or Reliance 3g? Or should i go for photon plus?? Hi.. I have an idea sim and itz quite fast in my area. I want to know which dongel i should buy so that the idea sim is compatible with it for surfing net on my lappy ,downloading e-books and streaming videos really fast. Should i prefer idea 3g or 2g is also good for surfing. Please suggest. If you want to use your SIM Then buy Huawei E3121 3G Data Card and Insert your SIM. Sorry to Say MTS has Switched off their Network, So you have to Use other Network Such as Airtel or Idea Netsetter which gives High Speed Internet. and can MTS Mblaze be used with a zen 7 inch tablet plz reply adios …..
Hi , I am From Kolkata(West Bengal) My friend uses MTS MBlaze 3G Dongle in Asus Laptop But Says That He Gets a Very Low Downloading , Browsing and gaming Speed. Actually He lives In a Damp house and doesn’t get network half the time so can you suggest me a good dongle which give a high browsing,gaming and downloading speed with at least 3G data plans in a month. Go for Airtel Dongle or Reliance Dongle…. Hi, Thanks for sharing such information, not easy to find such comparison of multiple products in market. I’m in Bangalore and will be travelling to Rajkot Gujarat for about 2-3 weeks. I will be working from there and need to have at least about 7-8Mbps speeds with most FUP. I have Huawei Power-Fi E8231, rated @21.6mbps that I’m planning to use. Can you please suggest me the service provider / sim card that can give best speeds and FUP? mostly going to be in Rajkot, Gujarat but would be travelling a bit over weekends (when I may not need that high speed). Myself Ankush nd’ i m from Jammu, I want to buy my first 3G dongle connection, So plz suggest me the best 3G dongle, according to my area. Plz rply me as soon as possible..
i’m living in thane(wagle estate) area.i want to buy a donggle. which dongle gives me best reange,best speed,and less recharge in my area. by the way what is 2gb unlimited speed? unlimited mean what? WHAT IS DIFFERENCE BETWEEN RELIANCE NETCONNECT+ AND RELIANCE NETCONNECT 3G ? AND WHICH IS BETTER IN MAHARASHTRA ? Hi i wanted to know which dongle would be better? realince or mts? there is reliance tower located near my hostel… few of my friends have told me that mts is good.. but iv seen reliance do its job.. n it was good.. i want a dongle to surf the internet with high speed and download speed. and that wont stop unexpectedly and having good coverage,,please reply ASAP if possible!! Pari I advice you to go for reliance netconnect plus..
Vandy I think you should prefer dongles Like reliance or Airtel etc..
,think it ll be quite usefull ,keep doing dis fab job. Hence tysm broda. Which dongle should I use in Pune? My budget is 1000-1200 for unlimited access and 7.2Mbps speed? Does MTS 3g dongle work everywhere? 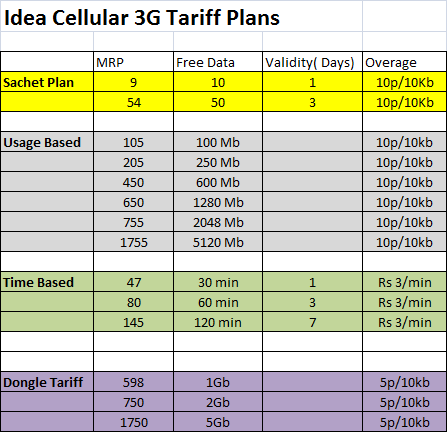 Is idea 3G data card worth taking in hyderabad.? Will i get good speed? Ya idea 3G is worth buying and have good browsing speed. Airtel and Idea have good Connectivity..
for skype (video calling) which dongle and 3G sim , you prefer ? FOR SKYPE (VIDEO CALLING )IN BANGALORE CAN U SUGGEST WHICH SIM I WANT TO PREFER? AND WHAT ARE THE UNLIMITED PACKAGES FOR THAT SIM?? Hi.. Which dongle is best for movies download with great speed in kolkata…. I want a dangle that Hav good speed after its 3G data is over . 2g data with good speed and unlimited. Suggest me one . I’m from punjab . I want to use it for Dowloading movies and watching videos . Is mts postpaid rs 450 unlimited plan ok for playing online games. What is the maximum ping it gives? Ya for Playing Games it would be enough because it won’t require high speed and also it depends on what type game you are playing like counter strike or mini games. Which WiFi dongle would you suggest for Jaipur(and outside Jaipur-Highway)? In terms of coverage and speed…. Idea or MTS? I want to travel in all corners of India for 3 weeks. Which company’s dongle would you suggest?